Lowe’s, the home-improvement retailer, announced it was closing 20 underperforming stores across the United States as part of a restructuring program under new Chief Executive Officer Marvin Ellison. The company is also closing 31 stores in Canada. Lowe’s said the closures would reduce earnings by between 28 cents per share and 34 cents per share, or between $300 million and $365 million in pretax expenses. The costs were not reflected in the guidance the company provided when it released second-quarter earnings in August. 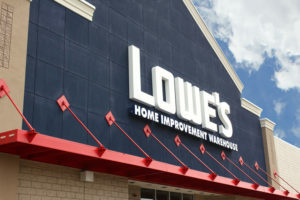 At that time, Lowe’s said it expected to earn between $4.50 and $4.60 per share in the fiscal year ending Feb. 1, 2019. Lowe’s operates more than 2,000 stores in North America. Lowe’s previously announced plans to close its Orchard Supply chain of 99 stores in California, Oregon, and Florida. It said that closure would lead to between $390 million and $475 million in write-downs. The latest closures will be finished by February, the company estimated. It has partnered with Hilco Merchant Services to help manage the process in the United States. Lowe’s shares have gained 4.2% year-to-date but it has trailed its rival, Home Depot, in terms of revenue growth. Ellison was a top executive at Home Depot for more than a decade, and most recently was CEO of JCPenney’s. In July, Lowe’s announced it was eliminating the positions of chief operating officer, chief customer officer, corporate administration executive, and chief development officer. Chief Financial Officer Marshall Croom retired in October, as previously announced. Lowe’s said it will give more information on the impacts of the closings when it reports earnings on November 20.